Paul was called to take the gospel of Jesus Christ to the Gentiles after his conversion on the road to Damascus (Acts 9). Before this he was a hater and killer of Christians. In Acts 22:20–21 he wrote “And when the blood of thy martyr Stephen was shed, I also was standing by, and consenting unto his death, and kept the raiment of them that slew him. And he said unto me, Depart: for I will send thee far hence unto the Gentiles.” So as you can imagine his portrayal of Jesus in the Epistles (letters) that he wrote is quite personal. As a matter of fact, Paul describes Jesus differently in every letter (with the exception of Philemon which was a personal letter of appeal to a slave owner). 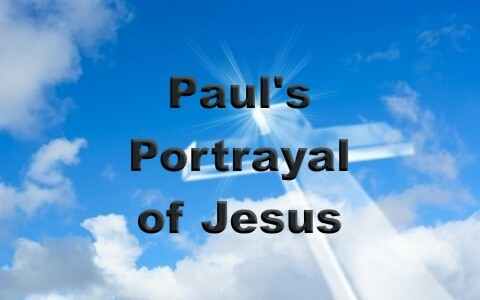 Take a look at Paul’s portrayal of Jesus in the epistles and key verses below. My list includes passages from Hebrews because though it is somewhat unknown I believe Paul wrote this letter. Romans 5:1–2 Therefore being justified by faith, we have peace with God through our Lord Jesus Christ: By whom also we have access by faith into this grace wherein we stand, and rejoice in hope of the glory of God. 1 Corinthians 5:7–8 Purge out therefore the old leaven, that ye may be a new lump, as ye are unleavened. For even Christ our passover is sacrificed for us: Therefore let us keep the feast, not with old leaven, neither with the leaven of malice and wickedness; but with the unleavened bread of sincerity and truth. 1 Corinthians 15:24–26 Then cometh the end, when he shall have delivered up the kingdom to God, even the Father; when he shall have put down all rule and all authority and power. For he must reign, till he hath put all enemies under his feet. The last enemy that shall be destroyed is death. 1 Thessalonians 4:16–17 For the Lord himself shall descend from heaven with a shout, with the voice of the archangel, and with the trump of God: and the dead in Christ shall rise first: Then we which are alive and remain shall be caught up together with them in the clouds, to meet the Lord in the air: and so shall we ever be with the Lord. Paul had a unique perspective of Jesus. He was a devout leader in the Jewish faith and yet God redeemed Him to be the one to take the gospel of Jesus Christ to the Gentiles after the Jews rejected it (Romans 11). He was faithful to preach Jesus and go out to start churches with the mission to do the same. I am so glad God saved Paul for this purpose and because of him the gospel is extended to me! Thank you for the encouraging words Steve. Previous post: What Does Judgment Starts At The House Of God Mean? Next post: What Responsibility Do Adult Children Have To Their Elderly Parents?